Inspired by the zoot suit era, Tinker Hatfield and Tom Luedecke join forces once again to create the Air Jordan 2012. Inspired by the zoot suit era, Tinker Hatfield and Tom Luedecke join forces once again to create the Air Jordan 2012. Cues were pulled from dancing shoes of the 1920s and 30s, when jazz saw a surge in popularity. The design reflects a young Michael Jordan's brash, confident game. Behind the concept "One Shoe, Three Flights," the 2012 featured three different midsole cushioning options that allowed wearers to control the game based on playing style. "Fly Around" featured forefoot foam and a Zoom Air unit in the heel for quick perimeter players. "Fly Over" consisted of Zoom Air in the forefoot and encapsulated Air in the heel for the player that relies on elevation. Lastly, "Fly Through" was equipped with full-length Air for power players. Additionally, there were two inner bootie options that complemented your game style. The low-cut sleeve best suited quicker players seeking greater range of motion, while the high-cut sleeve enhanced overall stability. Other 2012 features included a well-constructed outer shell, the debut of a Jordan-specific carbon fiber weave shank plate, a double-stitched wingtip detail on the toebox in the shape of an 'M' and scratch marks that represent MJ's "Black Cat" nickname. 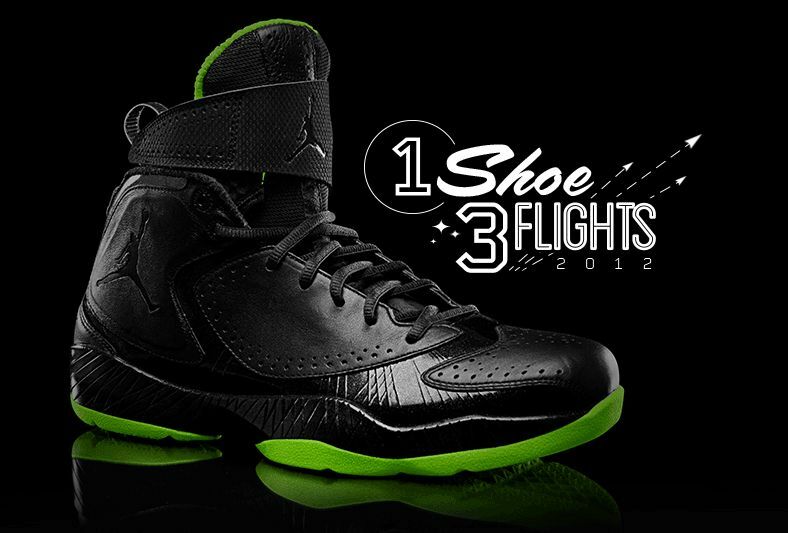 Day 27 of the XX8 Days of Flight brings us a look at the "Stealth" Air Jordan 2012 in black and neon green. Continue to follow the XX8 Days of Flight here at Sole Collector, ajxx8.com and @Jumpman23 on Twitter. Also, don't forget to share your 2012 photos on Instagram for a shot at winning the Jordan Brand's XX8 Days of Flight Giveaway.